Eloise Irving is a soprano who was a choral scholar at Kings College, London. 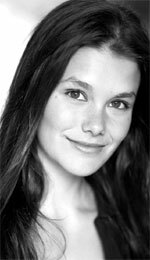 She is currently studying singing with Paul Farrington having trained in acting at Webber Douglas and voice/harp at the Guildhall School of Music. She began her professional career by winning the 1998 BBC Radio 2 Choirgirl of the Year competition. This led to her appearing as a soloist in a wide range of music programmes on radio and television and further solo performances at the Royal Festival Hall, Fairfield Hall and Birmingham Symphony Hall. Opera engagements include appearing as Almirena in Handel’s Rinaldo with Longborough Festival Opera, Galatea in Acis and Galatea with Chilmark Opera and performing the role of Maria in the Imperfect Pearl, a new opera which premiered at Kings Place. She has also performed and recorded with Polyphony, Tenebrae, AAM, Philharmonia Voices, Oxford Baroque, Platinum Consort, Sarum Consort, Oxford Camerata, the Eric Whitacre Singers and Gareth Malone’s Voices.